Home > MMDU Mullana > Are You The One? Looking for the Right Mentor to take you to the next level. One of the most hallowed tradition of MMDU is role of mentor during the life of student at MMDU campus. Students get a support system of mentors, which act as buttress during any academic, personal or emotional stress on student. These bonds last for ever, students even after passing out seek our advice from their mentors on career moves, life decisions like marriage etc. We all need support and guidance in almost every aspect of our life. Hence, we look for mentors around us. While finding a mentor isn’t tough, finding the RIGHT mentor is daunting. “The ordinary teacher tells. The good teacher demonstrates. The great teacher inspires“. And the right mentor is the one who embodies all these qualities. But, before we move on to learning how to choose the right mentor, it is important to figure out what you are trying to achieve. 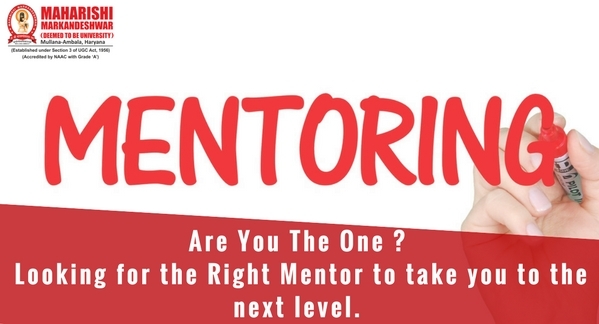 • Do you need a mentor to help you take your career to the next level? • Are you looking for help in a specific aspect of your career? • Are you trying to hone your own skills, strengths, and experience for the next five years? • Are you looking for getting support for some particular challenges you are facing currently? Why You Need a Good Mentor? Typically, all the successful people have one thing in common: a mentor. To be successful in life, it is very important to have a mentor – someone more experienced than you, someone who can be your role model, someone who you could confide in and learn from during tough times. • To Listen – True mentors listen to you with complete dedication. Listening carefully is one of the best gifts that mentoring brings. It feels good when we are heard and it can be a powerful force in motivating you to think, make decision and take action. • To Question – We all have questions revolving around what, why and how’s of life. When we are free to put our queries before the mentors, it helps broaden our thinking. We learn to analyze and evaluate, identify various solutions, and develop our understanding of ourselves. Hence, having a mentor can help us in uncovering various possibilities. • To Learn from Real Experiences – Often mentors willingly share their experiences and lessons with us. Their experiences help us learn from mistakes and how to deal with a specific challenge or problem in life. • For Boosting Challenging Abilities – Mentors help us learn the ability to stretch ourselves during challenges. This makes us understand of who we are in reality and what’s our potential. Real mentoring is about growth, taking you beyond your capabilities and who you are now and who you can become. • For Motivation and Support – Mentoring is a partnership where both the mentor and the mentee have some responsibilities. Having a mentor offers great support and can be used as a source of encouragement in life. Mentorship is about sharing experiences, learning from them and being able to face the challenges. This is a great way of enhancement and Improvement. Also, once you find someone you believe could make a great mentor, ask yourself whether you will be able to sit down for hours and talking with that person. The right mentor will love what you are doing and your passion. Ensure that they are interested in you and help you in achieving your aim. Pills Or Herbs? We Guide you Right at MM Campus.